Pre Operative Yoga Poses for gaining overall strength in the hips and core. Bridge Pose with one foot over the other leg knee. The role of a yoga therapist for students who have damaged hips is a very critical one as these students might need more emotional support. If they have been advised to undergo a hip replacement surgery then their therapy sessions should focus on improving physical strength, encouraging emotional balance, building more confidence, cultivating acceptance, teaching them to surrender, helping them feel grounded and aware of their body, breath, and mind. All of these make a complete sequence, helping students through the healing process. Yoga therapists should always begin the session by explaining the anatomy of the hips, femur, hip joints, leg muscles and their relation to supporting the pelvic girdle, in a clear manner to the students. Yoga therapists need to work differently if these students are new to yoga, as they may lack knowledge and confidence in yoga in addition to their bodies. By introducing a simple breathing technique like Dirga Pranayama (Three Part Breath), students get comfortable and start building both, knowledge and confidence. Once this comfort is established, working with the students post-surgery will be more promising and fruitful. All the above methods have different limitations of the hip movements. Though the approach of yoga post surgery should always be safe, the anterior approach is said to have lesser restrictions of hips movements. Under these categories, the students should practice with complete awareness, while teachers make efforts to keep the communication clear and easy. 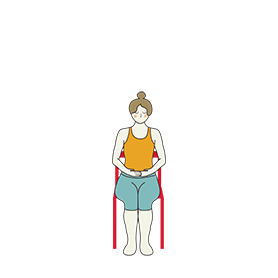 The chosen yoga poses refrain the hips from moving either internally (one leg moving towards the other) or externally (one leg moving away from the other) as a precaution. Throughout the sequence, yoga teachers should encourage positivity and deep focused breathing, teach students to love and respect their bodies, increase energy with longer pranayama and meditation and lastly, appreciate the students' sincere efforts. Note: The information shared here is for educational purposes only and is not a replacement for medical advice. Please consult a medical professional for the same. View the complete yoga sequence with 40 yoga poses. 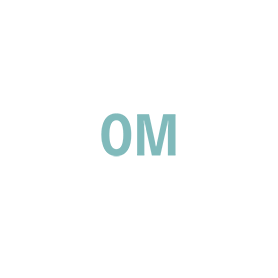 Sign-up for free to Tummee.com yoga sequence builder to view, copy, and edit the sequence. Get started today for free! The set of yoga poses given within the bracket are mainly to prepare for Hip Replacement Surgery. These poses work directly on the core, while engaging the hips without causing too much movement. Follow the cues carefully as they give more information on precautions and encourage careful practices. Yoga Poses within these brackets are practiced on the Bed, while lying down supporting the neck. No pressure is to be felt anywhere while practicing these yoga poses under Pre Operative Poses For Hip Replacement. Constantly checking with the students about their comfort, is very important. Making sure the students understand the body movements, and for the same, teachers explaining the human anatomy of the hips and the effect of breathing with each movement. A.Begin seated on a Chair to prepare the calming of the mind with the chanting of OM. B. Sit comfortably on a chair, supporting the hips and ensure the feet are firm on the floor. Take a deep inhalation and as you exhale say the words OM, taking the exhalation longer. C. Take this practice for 3 minutes to encourage positive energy, while resting the body and the mind completely. D. A great practice to cool the nervous system thereby encouraging the flow of positivity while staying calm, focused and relaxed. E. A relaxed body and mind is a good way to keep one healthy and in control. This is the first stage towards healing, when the mind is prepared and supports the body along the healing process. Meditation has its benefits if done regularly making sure the mind even if it wanders, should not be a concern. This mind will wander initially, allow that to happen, and slowly with practice this too will come in control and make the meditation practice more meaningful and beneficial. B. It is definitely not easy to prepare oneself for a surgery, knowing the healing process can be long and painful. C. While yoga with it's asanas are good and make the required muscles strong and fit, its the mind that needs more healing and support. Emotionally one deals with a lot, asking questions like: Will I be able to live a normal life?, Will it affect my health in other ways? and many more. D. Hence, with yoga and meditation the journey to fight the preoperative stress and post operative stress should be promising taking control of the mind thus healing the body. A. Students should lie down on a bed and not on the floor. B. Lie down on the bed, stretching the legs out, taking a few rounds of breath to settle down and relax. .
C. Inhale and raise the arms above your head and stretch the entire torso upwards. Exhale and stretch the entire lower body downwards while pulling the feet and toes towards the floor. D. Pull the belly in without causing too much stretch to the hips and the pelvic bone. But, it is essential to move the hips and the pelvic bone upwards towards your navel. E. Pull and hold this posture for 6 breaths or less, choosing what suits the body. While here close your eyes and remain connected to the stretch at the hips. Imagine the hip joint and the pelvic bone when you connect. Tighten the quads, the gluteus maximus, the feet, all the toes, and the shoulders and arms. F. The complete body stretch in Stick Pose uses the core muscles to the maximum. The strong core muscles, the better back, and better back is a great support to the hips and the pelvic bone. G. The choice for doing this at a stretch of 6 breaths or holding for 3 breaths and releasing before continuing again, should be based on the comfort of the body. A. 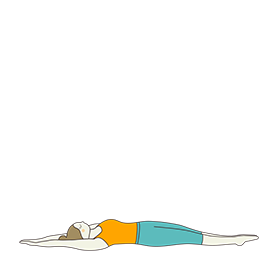 Release from Stick Pose and relax completely to connect to the breathing in a more relaxed way. B. 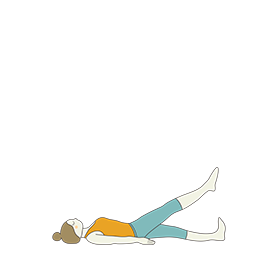 Then, inhale and raise the right leg up (not more than 10 degress off the floor), exhale and bend the left leg to rest on the heels. C. Stretch the extended leg, tightening the quads, hamstrings, gluteus maximus, and the core muscles. Extend the toes out completely, and hold the posture for 6 breaths. D. While pulling the abdominal muscles in, be aware of the stretch at both the hips. Make sure the stretch is not causing pain or more discomfort. E. Release and repeat with the other leg. A great way to work on flexing the hips while not moving them too much. The muscles, tissues, tendons at the hip joints are the target focus area. Stay to feel the slightest of stretch and connect to it. Connections with the body are a great way to start the healing process. F. Try to work longer on this pose with the hip that needs replacement, if it is only for one hip, otherwise equal for both. A. Continuing with the practice, release from Raised Leg Pose Variation, and relax completely. B. Inhale and raise the right leg up (not more than 10 degrees off the floor), and exhale stretching the foot, toes out completely. C. Engage the quads and the core muscles while connecting to the hip movement and pelvic bone movement. Stay with the Legs Raised for about 3 breaths. D. Release and repeat with the other leg. Hold the pose longer with the damaged hip. 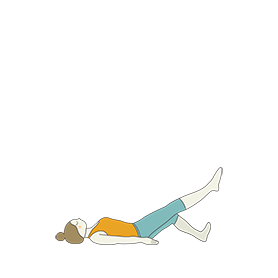 Do not over stretch as the legs should not go beyond 90 degrees. E. Again a great pose that will strength the core, hips, back, legs, and pelvic floor muscles, all of which are needed during the post surgery healing process. F. Placing a bolster below the legs can be done if needed . A. Release from Raised Leg Pose Variation and come to relax completely. B. Inhale and lift the torso up (30 degrees) while supporting it with your elbows. Exhale and raise the legs up (10 degrees), and use the core muscles to hold this position for about 3 breaths. C. Stay in Boat Pose On Forearms for 3 breaths, release as you exhale and repeat again to hold for 3 more breaths. D. Engaging the core, hips (without overstretching), quads and shoulders and arms to stay in balance. A lovely overall body toning pose that will build confidence while keeping the engaged muscles active and strong. E. An alternative way if confident is to move the legs slowly up and down in a dynamic way coordinating the breathing, but care should be take to be aware of the body. View all 40 yoga poses with cues. Sign-up for free to Tummee.com yoga sequence builder to view, copy, and edit the sequence. Get started today for free! Tummee.com is rated 5 out of 5 stars by yoga teachers worldwide (read 100+ 5* reviews on Facebook) and has a collection of 90000+ yoga sequences, 25000+ cues, and 2300+ yoga poses. Learn more to join your fellow yoga teachers.